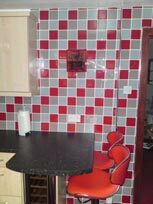 Service with a Tile is an accomplished wall and floor tiling company with bases in West Lothian and Edinburgh servicing the Central belt and the Lothians. We consistently provide a professional, reliable and competitively priced service to both domestic and commercial customers in Edinburgh and the Lothians. Throughout our years of trading we have gained all the qualifications, experience and the right tools to carry out all types of jobs including the fixing of all tiles such as ceramic, mosaic, porcelain, marble, slate and tavertine,in addition to tile and natural stone installation. Whether you are looking for a tiler to do a small repair or regrouting job to a New kitchen or bathroom fitting we can provide the skills and know-how to make sure you get that designer finish. Just click here to contact us with any questions or enquiries you may have.